This large bowl features a sparkling gold topaz exterior, with some dark red highlights and real gold adventurine added for that extra sparkle. The interior features a lovely murrini pattern. 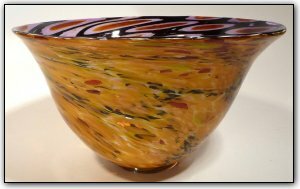 Working with murrini is a three stage time consuming process, first Dirwood hand pulled the canes used to make the murrini after which he cut the canes into the individual murrini pieces, then he used the murrini to make patterns on the glass as he made this gorgeous bowl.